What is a butter tart? If you’re from Canada you may be looking at me like I’m off my rocker because who doesn’t know the deliciousness of a butter tart? 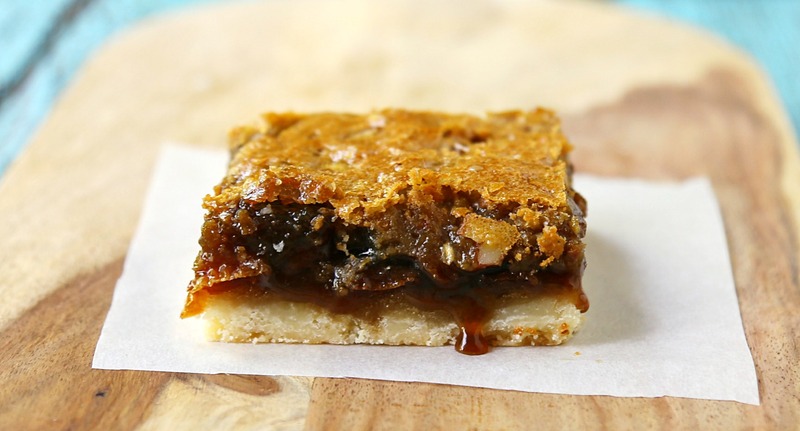 Many, many folks haven’t tried a butter tart and that’s kinda sad. Butter tarts are becoming well-known everywhere which is a glorious thing! They’re somewhat like a pecan pie, without the nut topping but the filling tends to be runnier. You start with a pastry shell and end up with a sweet dessert that we all adore. 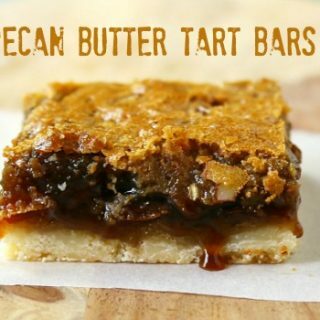 Today I’m sharing my recipe for Pecan Butter Tart Bars which use the same filling as the butter tart but I’ve made them with a shortbread crust so that you can bring them along to events. 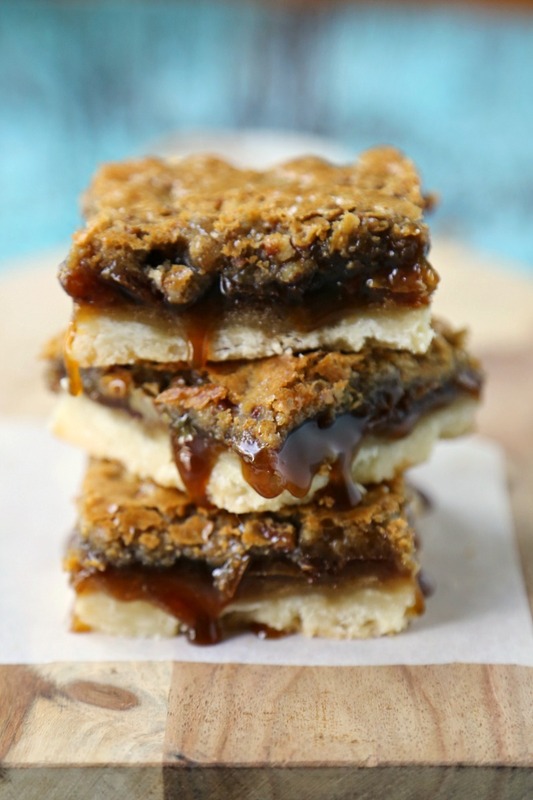 My family adores shortbread and in this recipe it’s nicely accompanied by the sweetness of the butter tart filling and the nutty flavour of the pecan. Place icing sugar and flour into a bowl and “cut in the butter”. You do this by cutting the butter into pieces, place on top of the flour/icing sugar and coat them all. Use two forks or knives, moving in different directions to combine the butter with dry ingredients. You will end up with pea sized bits that stick together if you press them. Press this mixture into the 9 x 13 parchment-lined pan and bake for 10 minutes and set aside. Melt butter in the microwave and whisk in the eggs, lemon juice, vanilla, brown sugar. Stir in the raisins and pecans. Pour the mixture over the crust and bake until the filling is set, approx 25 mins. It will be jiggly but make sure it’s not still liquid. Refrigerate for an hour or two before cutting and serving. Place icing sugar and flour into a bowl and "cut in the butter". You do this by cutting the butter into pieces, place on top of the flour/icing sugar and coat them all. Use two forks or knives, moving in different directions to combine the butter with dry ingredients. You will end up with pea sized bits that stick together if you press them. Pour the mixture over the crust and bake until the filling is set, approx 25 mins. It will be jiggly but make sure it's not still liquid. These look excellent and easy, hubby’s favorite! Thanks for sharing. 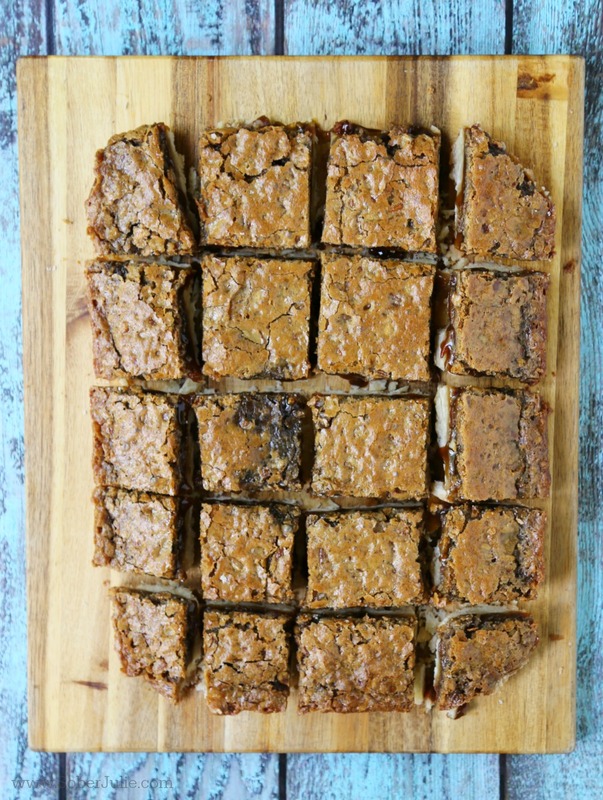 Ok, here I am at 8:30 a.m. , printing a recipe for these squares, wishing I had all the ingredients in the house. (which I don’t) Thank you for sharing this delicious looking square. ps. Are there pecans in your recipe? I don’t see them listed. Maybe just the name? I suppose they are like buttertarts, some like nuts, some don’t. lol. These sound good. I have not made butter tarts in a while. YUM!!! I can’t wait to try this recipe! They are cooling in my fridge right now. They took 31 min in my gas oven to cook. This was super easy to make! I ended up adding a 1/4 cup of flour and a 1/2 tsp of salt to the crust. I knew the filling was going to be super-gooey, so I wanted the base to be a bit firmer/dryer. I also left out the raisins but upped the pecans. Baked for 35 minutes, but perhaps my oven is cool? The consistency was perfect, soft and gooey but not messy/hard to eat. An absolute hit! Had like 50 people ask for the recipe. Definitely will make again.